Akonia’s CEE Change™ is the training success framework that focuses on enhancing the capability of your Workforce through effective learning which enables your Organisation to satisfy your Market’s demand and achieve greater success, growth and profitability. CEE stands for Capability and Effectiveness Enhancement. The diagram below is divided into two halves. The top 3 segments of the CEE Change hexagon (Workforce, Market and Organisation) are supported by the lower 3 segments (Management, Systems and Training). Without the support of the lower segments your Organisation will not be able to achieve its purpose, business goals and financial targets to fulfil Market demand for your products and services by using the roles of the Workforce who are focused on achieving your management objectives (MbOs) in a conducive and productive environment. 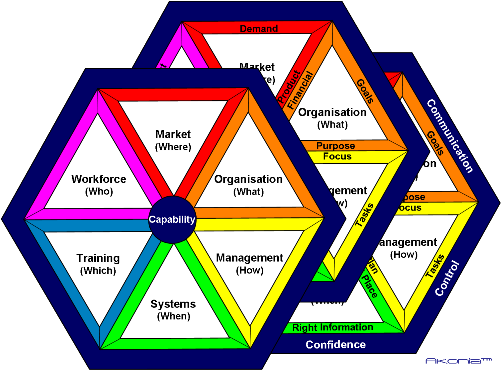 This is reinforced in the diagram by supporting the Market segment securely between the Workforce and Organisation. Likewise, Management is responsible for maintaining focus by specifying relevant tasks and implementing a plan to fulfil your Organisation’s purpose. In order for the Workforce to successfully fulfil their roles they must be trained in the appropriate skills to perform their jobs using Skills Gap Assessment (SGA) and Training Needs Analysis (TNA) techniques to formulate Individual Training Plans (ITP). This must be supported by effective production, transaction and management information systems that ensure the right information is available in the right place at the right time. On each side of each triangle described above are essential elements to support the segment’s focus and purpose. Remove any side of the triangle and it collapses. Reinforce each side of the triangle and it strengthens. Holding the CEE Change hexagon together are six critical C’s – Customer, Communication, Control, Confidence, Care and Clarity. These are strengthened by enhancing the Individuals and Organisation’s capability which ultimately leads yourOrganisation to greater success, growth and profitability.